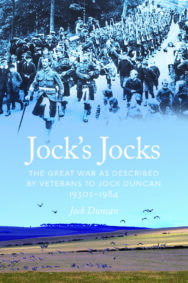 Between the 1930s and 1980s, folk singer Jock Duncan interviewed around 60 veterans of the First World War, mainly in his native North East of Scotland. He then spent many years transcribing his interviews in the rich variations of Scots in which they were spoken. The result, published here, is a unique and illuminating collection of firsthand witness testimony to the horror, and humour, of the Great War. A one-act musical play, of the same name, by Gary West and based on the exact words of these soldiers, has been performed in Blair Atholl and was part of the Scottish International Storytelling Festival in Edinburgh in 2018. Jock Duncan is an entertainer and singer, particularly of North East of Scotland traditional ballads.